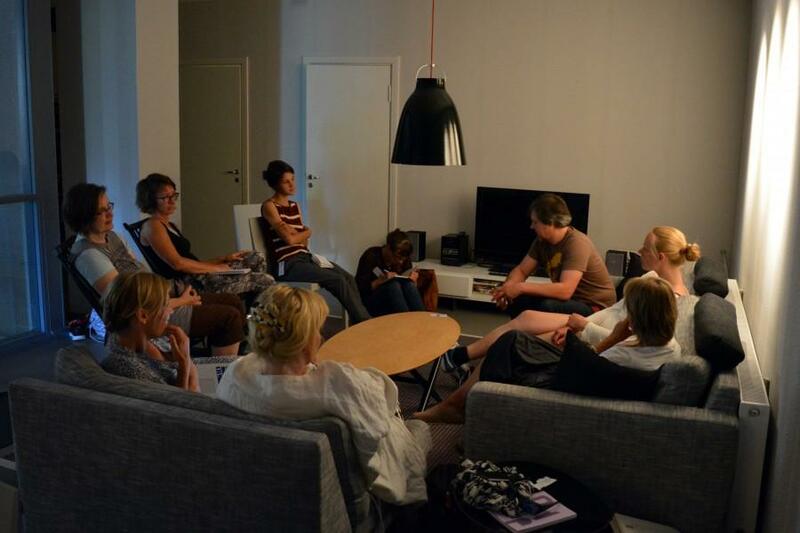 In August, the Saari Residence held a Summer Well event in collaboration with the Helsinki International Artist Programme (HIAP), Frame Finland, the Academy of Fine Arts and the Pro Artibus Foundation. 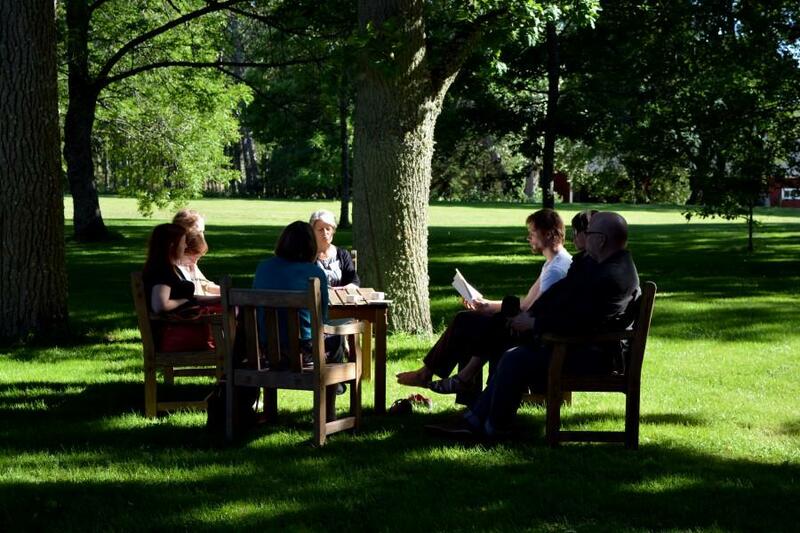 Artists, researchers and other experts gathered at the Summer Well this year to discuss the themes of localism, mobility and residencies. 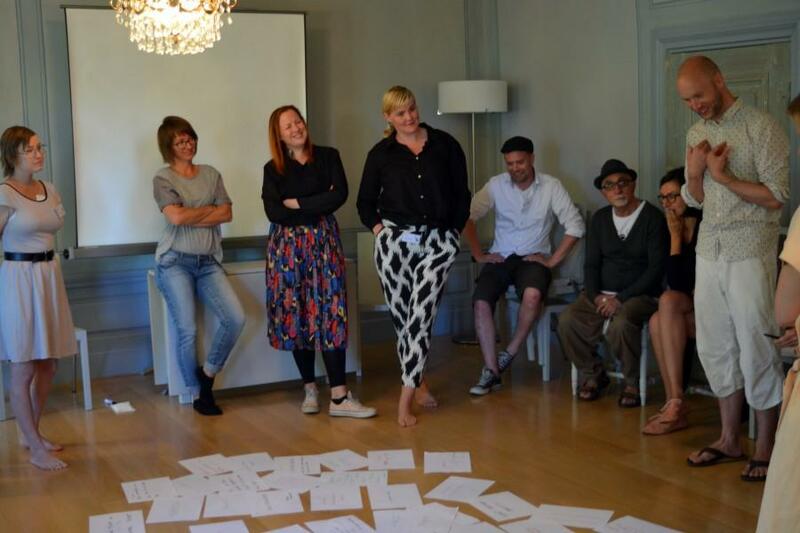 They worked in groups, and their discussions were based on works of art related to themes such as Archipelago Scifi by Tellervo Kalleinen and Oliver Kochta-Kalleinen, Sound Map Hailuoto by Antye Greie and Immigrant Garden by Kalle Hamm and Dzamil Kamanger. Befitting the themes of the Summer Well, the groups were named after migratory birds: The Cranes, The Swans and The Geese. 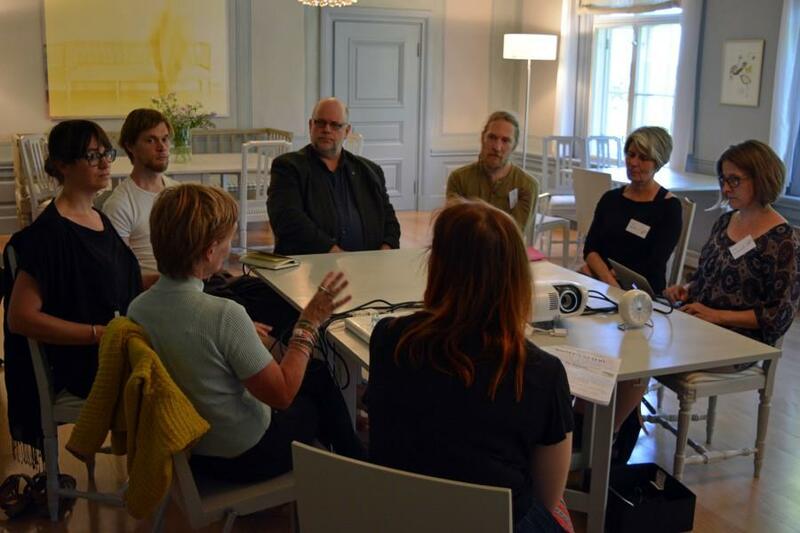 The participants were Greie Antye, Pia Bartsch (Kone Foundation, Saari Residence), Taru Elfving (Frame Finland), Juha Huuskonen (HIAP), Kalle Hamm and Dzamil Kamanger, Olga Jitlina, Signe Johannessen, Jonimatti Joutsijärvi, Jouni Jäppinen, Tellervo Kalleinen and Oliver Kochta-Kalleinen, Anna Kirveennummi (the Advisory Board of the Saari Residence), Irmeli Kokko (the Academy of Fine Arts), Tuija Kokkonen (the Advisory Board of the Saari Residence), Christine Langinauer (Pro Artibus), Åsa Lönnqvist (Pro Artibus), Sabine Meister, Hanna Nurminen (Kone Foundation, Saari Residence), Antti Salminen, Joanna Sandell, Anna Talasniemi (Kone Foundation) and Maria Valkama. – The starting point for the discussion is a short film called Archipelago Science Fiction by Tellervo Kalleinen and Oliver Kochta-Kalleinen. Before we start watching the film, moderator Irmeli Kokko introduces the session by presenting the film’s context, i.e. the Finnish Archipelago and its way of life. 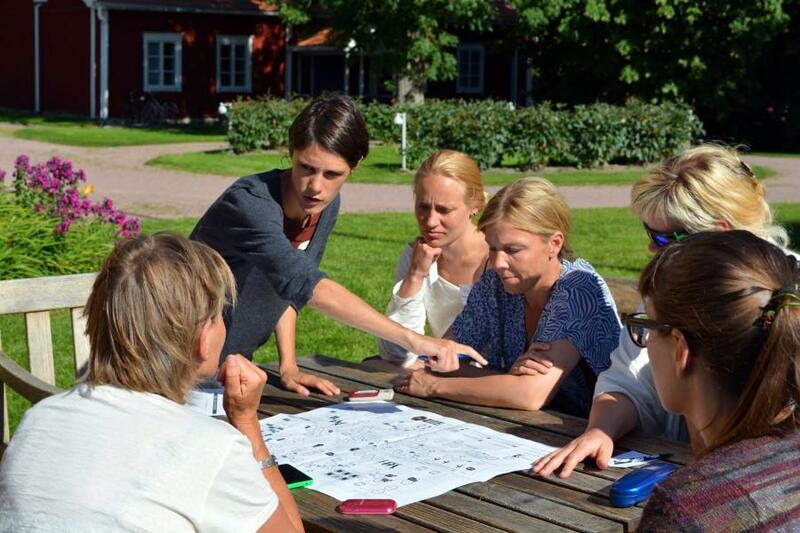 She spreads a huge map onto the table and points out the islands of Utö and Nötö. Kokko explains that the islands of the Finnish Archipelago are very different in terms of their environments and the way of life that has developed on each island. The islands are rather isolated from one another and so a coherent archipelago culture has not been able to form. An example of this is that different dialects are spoken on different islands. Kokko used the book “Ulkosaaristossa” (In the outer archipelago) by Benedict Zilliacus as her source of information. – Oliver Kochta-Kalleinen then speaks briefly about the film. The piece was commissioned by the CAA (Contemporary Art Archipelago) and the task was to create a site-specific and inclusive work of art in the archipelago. Since the 1970s, the number of islanders has been radically declining as a result of huge social changes, and the issue of the archipelago’s future and vitality has come to the fore. The artists wanted to deal with this issue in their piece. According to Kochta-Kalleinen the difficult situation manifests itself as conflicts between the islanders and holidaymakers from the mainland, for example. – The Archipelago Science Fiction film presents four future scenarios describing life in the Turku Archipelago in 2111. The scenarios are as follows 1) a health paradise for pensioners, 2) lifestyle migration, 3) neo-capitalism in a post-apocalyptic world and 4) an open-air museum owned by the Chinese portraying life in the archipelago in 2011. The film is comical and arouses plenty of thoughts among the participants in the discussion. – Others want the artists to tell them more about how the piece was created. The artists explain that they organised workshops for the islanders, interviewed them and used questionnaires. The islanders were asked to imagine what life in the archipelago might be like in 100 years’ time. The artists explained at the outset that the idea was to make a sci-fi film, so wild and extraordinary ideas were welcome. When they started the project, the artists had not been planning to make the piece into a film, but this idea came up during the process. The artists worked on the material that had been created in the workshops and interviews with the participants in the community art project but they wrote up the final film manuscript themselves. 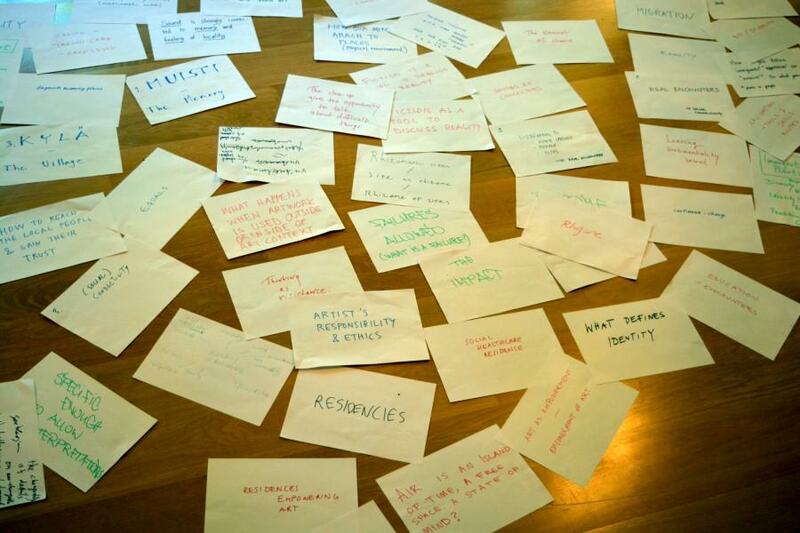 It was not possible to include some of the ideas suggested by participants for technical reasons, for example. The islanders participated in the shooting of the film as actors. Tellervo Kalleinen and Oliver Kochta-Kalleinen also appear in the film. One of the project participants turned out to be an experienced animator, so he produced the animations in the film. – The discussion moves on to the ethics of community art and the types of problems that may be associated with cooperation projects between an artist and a group. The fact that the artist brings his or her own prejudices to the group is problematic. Even calling people a “community” or “local” can be misleading and define in advance a group that does not even exist. Participants of the project must not become objectified to serve the artist’s intentions. It may be difficult to understand the difference between something that is inclusive and something that objectifies. An artist has traditionally had the freedom to move from one community and culture to another, and to study and explain what he or she has seen. From this perspective the artist is like an anthropologist. The artist can highlight phenomena and problems and give a voice to those whom we can’t hear. However, at the same time, a power relationship is always related to this. – The participants in the discussion think that the future scenarios presented in the film do not seem completely unreal. After all, truth is often stranger than fiction. For example, Signe Johannessen explains that in Sweden there is an island where it is forbidden for people to be born or to die. If an islander is pregnant, elderly or shows “signs of weakness” he or she is removed as there are insufficient resources on the island for those who need hospital treatment. On Utö there are also strong controls on who can move to the island. While young people and families with children are welcome, pensioners and summer residents are not. – There is discussion on the potential of sci-fi and other fiction to explore reality. Sci-fi is a good way of examining future fears, hopes and social tendencies. In sci-fi we distance ourselves from real life and are allowed to enlarge and play with various ideas. By being playful and distancing ourselves from real life we may be able to make accurate observations of reality. The participants in the discussion point out that the setting in utopian literature is often an island. An island can be considered a metaphor for society. It is like a miniature version of society. When the examination is focused on a small area, it may be possible to notice large global phenomena in the details. – The discussion moves on to residencies and their future. What would a future sci-fi residency be like? Could residencies become the type of places that are presented in the film’s various scenarios? What would a residency for pensioners be like? Could the Saari Residence become an open-air museum on the residencies of the past? How about a detox residency? Or a residency providing a safe haven of creativity for all, which is far away from the reaches of large social problems? – Olga Jitlina’s piece, Russia, The Land of Opportunity is a board game on the subject of the life of migrant workers from Central Asia in Russia in 2011. Jitlina introduces the subject by describing labour migration to Russia in general. Huge numbers of workers come to Russia in particular from the Central Asian countries that were once part of the former Soviet Union. People from these countries can come to Russia for three months without a visa or work permit. A work permit entitles the holder to stay in the country for one year. Workers are attracted to Russia by the higher salaries. There may also be greater freedom to live life as you want in Russia than in the country of origin. The people coming to Russia work in the country for different lengths of time, for example on a construction site or in the service sector. Many of the former Soviet countries in Central Asia are very poor, so the income that these people take home from Russia forms a significant share of the countries’ economies. There are two versions of the Russia, The Land of Opportunity game. One (art version) is intended for a Russian audience to educate them about migrant workers and the challenges they face. The purpose is to get rid of the prejudices against these immigrants. The other version was produced later and is intended mainly for immigrants from Central Asia. It provides them with information on practical matters related to working in Russia, such as what types of documents are needed. Jitlina describes the Russia, The Land of Opportunity game as a poor man’s Monopoly. – We play the game together in teams of two people. In the game you experience life as an immigrant. Jitlina tells us a bit about the life of each character in the game, such as where he or she is from and his or her family situation. One of the people who sets off to try her luck in Russia is Anna from Tajikistan. She is divorced from her husband and leaves her children with her mother while she is away. The game deals with the opportunities, risks, problems and red tape that an immigrant may be faced with. Immigrants are also faced with lots of unforeseeable and uncontrollable situations, such as difficulties with the police and racist violence. Jitlina complements the game by describing the situations experienced by the workers. This is of utmost importance to help us understand immigrants and the environment that they are living in. – After playing the game the group is interested to hear what kind of people have played the game in Russia. Jitlina explains that the board game has been played by children in school and by adults in various situations. The game stimulates discussion. Even though many Russians know about migrant workers from Central Asia in general, the game can provide new insights, as it deals with the subject from the immigrant’s perspective. – Joanna Sandell asks whether the game’s players in Russia know that the game is a work of art. Jitlina explains that the players are made aware of this but that she doesn’t think that it is necessarily that important. The game is a work of art but it has educational goals. Zhitlina also explains that one goal of the game is to document the situation of migrant workers from Central Asia in 2011. Sandell explains that many artists have moved from artistic work to educational work as the financial standing of artists is poor, and they also believe that the structures in the world of art are dysfunctional. They use art as a teaching method but start to distance themselves from the art world. – Chance and uncontrollability are highlighted in the Russia, Land of Opportunity game. At the moment the future in general seems to be haphazard and chaotic. What is the future for residencies in the current cultural political environment? Is it based on chance? However, art can be used in many different ways, and precisely for educational purposes, for instance. If the support provided to art and its status in society weaken then perhaps the future for artists is to take on a more educational role. Using playfulness to deal with a serious and current issue. Pia Bartsch introduces the Saari Sirens project. Location Saari Residence, May 2012. The subject matter is women who no longer participate in working life: Women become invisible as they grow older. As a tribute to these women, Pia wanted to draw attention to these “little people” and make them visible. (“Little people” is the name that these women started using to refer to themselves during the process.) Pia started the project by knocking on doors and asking who would like to come and make some art. Well, of course she didn’t. Simo, the former grounds attendant, said there was no way she could go knocking on doors, she’d at least have to invite them for coffee and cake. At first Pia thought she would focus her project on women living alone, but then scrapped that idea. She spent time at weaving studios. “I sat there about 3-4 times, drinking coffee and eating buns and explained that I wanted to organise a festival and asked ‘would you like to come’”? What was the idea behind this? dro Rodriquez, made and played folk music in the 70s, was modest, wrote songs in support of the poor. Tried to sell his music, the music did not sell, gave up, “I don’t have the potential to be an artist”. Started doing a normal job. But did his work as if it was a special occasion. By wearing a tail-coat. An old lady who looked after Pia who was very dedicated to her work and wore a beautiful pinny, a nylon house coat. Marie von Ebner-Eschenback, did things for the poor, for culture, art and science as her guiding principle: a person is not an island, always connected to others. Jean Liedloff, lived in the Venezuelan rainforest in primitive conditions. Her approach guided her work: humans lost their primitive feeling of happiness when they started thinking about the meaning of life and stopped their animal way of living in the here and now. I wanted 13 women, well 12 and a bad fairy. But it always felt like someone was missing. Until I found the last one. (Presentation of the work.) Behind this is the idea that people speak in a completely different way when they are working on something with their hands. Conversation flows in a completely different way, more intimately, when you are working with your hands. In workshops we worked on appliqué and silk dresses: they have vivid colours, are emotionally charged. The appliqué was placed over the heart: the thing or person that holds a special a place in their hearts. (e.g. one husband. Cat. Mum. Grandchildren.) Talking about the person or thing that holds a special place in the woman’s heart was a very important part of the process and getting to know one another. A seamstress made the dresses for the performance. The women decided how their hair would be decorated. One wore her mother-in-law’s hat from the 1940s. Pia interviewed the women a lot – frequently, long interviews. The long interviews were condensed into four-page short stories of the women’s lives that were to be presented at the Saari Residence Open Day. A red carpet, white tables, symbolic colours. Each woman walked down the red carpet alone while Pia read the short story about her life. The friends and relatives who were gathered there heard these stories and also thoughts that the women would have never shared with others. Some were more comfortable walking down the red carpet while others had never been the centre of attention. Timo Juhani Kyllönen played the accordion during the performance, and he can also whistle like a bird. I spoke about methods of street art with the women. They wanted something more permanent and wanted to do something with flowers. We talked about where to plant the flowers. Pia suggested coffee pots. Someone else suggested handbags. Each woman was joined by a friend, acquaintance or relative to plant the flower. While they planted their flower each women told the younger people a story about the bag, which was written down. A photo was taken of the flowering bag, the woman and her guest. The bags were hung on the wall of the laundry room and a photo was taken of all the women. For the past few years Pia has been in charge of hanging the flowering bags on the wall of the laundry room each year. The women’s work was physically strenuous. This feels very remote to a city-dweller. How did relatives and acquaintances react? Pia explains that quite a lot of new things surfaced, such as humiliation, that needed to be processed. Bullying at work, for example. The women sometimes had low self-confidence. It later emerged that someone found the situation embarrassing. But they thought it was a really good project anyway. Pia: it’s a really good thing that the community artist will continue to be close and involved. This project was also the start of lifetime friendships. The process also uncovered plenty of different stories and not all of these were linked – heart, story, bag, all went in different directions. The heart was on the dress, but the related stories did not necessarily even need to be shared with the audience. It was perhaps more of an “inside” thing. Question: Have you asked how the project affected their lives? The participants were interviewed for Pia’s forthcoming book on community art. She found out that working on the Saari Sirens project had an impact on the time they spend together. In the interview Pia found that some of the women had seen the other women around but spending time together in an intensive way like this helped them get a completely new idea about someone else in the project. And how is art and culture involved? Now some of the women have started attending all of the local art events and concerts. Before they thought, for example, that “this snobby contemporary art is not for us – contemporary art is for snobs”. Pia has organised exhibition trips to Stockholm and other places with the women. Where were the women from? Two from Askainen and the rest here from Mietoinen. The women spoke about arts and crafts, what they are and arts and crafts in an artistic context. They went to see an exhibition of arts and crafts curated by Anna-Maija Aarras that was produced as a community art project at the Wäino Aaltonen Museum of Art (WAM). What is the attitude of the rest of the community to the women – impact through information – any impacts. Pia: Difficult to say. What effect did the media publicity have? The publicity that the Saari Residence produces from inside, from the perspective of the piece, with presentations, Pia: once one of the participants came along to talk about what he is doing. I think that it affects the community. Create new opportunities for identification, when people lose their jobs and they no longer have a group in which they feel they belong. It creates a group identity where you feel like you belong to something. Creating identity through art. Creating groups in which you belong and you feel you belong. More thorough research is needed into the way in which community art projects have an impact. Using your hands to think is something really meaningful. It is a fast way of creating a meaningful life, which is shared. The interface between a skill and art takes centre stage. People discuss matters openly when they are making things with their hands. Let’s talk for the sake of talking / art object and the subject experiencing this – various relationships, between the audience maker and the art maker and even everyday ways of doing things. Having a skill, more broadly, where is the route to relationships between art and practising a skill? Talk of a weaving studio and the micro-community that is created around practising a skill. Talking to yourself can be a certain type of “masturbation” while making is progress via problem-solving. Making is a different matter – always someone who will say, “I can show you how”. Projects in which people do not make things together remain superficial. When they are making things, people are present in the moment in a different way than they are when they are just speaking. It is a safe place to fail. Failure of a project – when will that happen? Is there such a thing? I scrap 95% of my ideas – this is not failure as the subject changes with the participants. How did I come up with the idea for the piece? Had I thought of it earlier? Local women? People become communities and migration is happening all the time. Communities break down all the time. The thing is what happens during the process. The process continues. The feelings that are there. A project that continues. Pia goes to a local community; the local community has x number of people; the people go home; the impression of the Saari Residence changes; in discussions the idea of the Saari Residence and its processes spread further. It is like a wiring plan or micelial network. Discussion on the idea of a micelial network. The micelial network spreads, the spreading would never end. A question of ethics: Pia has taken care of the discussions and the after-care provided to those who were made visible. Have you thought of a more structured continuation to the work? The women still come here. Discussion. Reflections. We need new people. Kari Tykkyläinen: Swamp skiing with women on You Tube. Women who are not wearing much. The work continued with the unemployed people in another project, which was an animation: did not want to be identifiable in the first piece. They appeared with a mask and paper dolls. In the second film they appeared with their own persona in front of the camera. How does the community affect the residency and Pia herself? Intensive, and there is always the danger that there is too much of everything. Ethics, morals, how big is the impact? The Saari Residence? 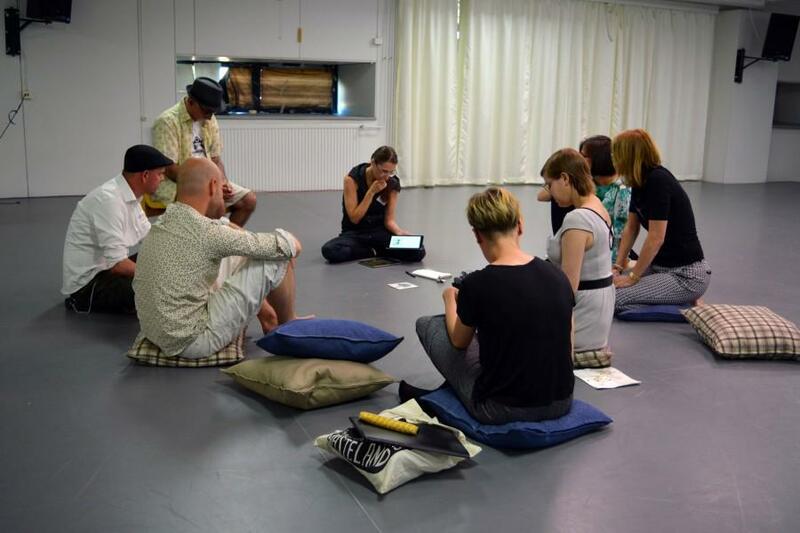 Performances have had an impact the residency artists who have heard Pia presenting the results of her work. Residency artists – local factor remains wafer-thin with these artists – are like parachute artists. Situation is different for Pia, because she is here all the time. Artists working on a specific project – stay for a moment, leave, are flown away. The artists’ attitude can also indicate a lack of contact or relationship (knowledge): I come here and I will show you a connection with nature in the space of two weeks. Bad impacts? You can always make mistakes, but if you can keep working with the same people then there is no need to always start again from the beginning. There are plenty of situations that require people to come together. Pia feels that vague projects are not community art projects: nor are projects that make the community into a slave, a pupil, artificially motivated by someone else. Pia is also ashamed by certain things later on. Is it possible to learn from failures? It is. Bad communities that need to be dismantled, destroyed or weakened. Are there such things? Bringing people together is the only way to get rid of prejudices. Pia is also an expert in bringing people together, who also meets artists. How successful are you in bringing these people together and into a group? – Pia: it varies. In the House of Sorrow project. In the Kivimakasiini building. Kivimakasiini asked whether something could be displayed there and Pia came up with the idea of displaying work with a group. What types of roles does Pia have? Pia is asked to provide a solution for a problem? Or – come and spend time with us and do something pointless with us. Trouble shooter? Doing things with local people who express an interest – with people who are actively involved, spreading, has already be added to the To-do list. But teachers, libraries, etc, often leave Pia to work alone and disappear off to do their own things. The community takes advantage of the artist? They are projects where you don’t get anywhere with the community as there is too little time. Suddenly the community has gone. And another thing: Schools have their own rules. That also prevents – pupils – there is so much on offer for them that I prefer to work with adults. It may be that one hour of art is too little. Of course, we always manage to do something (wolf project). Performances often provide a smartened-up picture of community art – experiences of failure are interesting and important. It is not possible to say for certain who said what here, but the main speaker was Jonimatti, unless otherwise stated. Members of the group ask questions. Jonimatti made a certain amount of changes to the poems at Saari – however, otherwise the piece had been created earlier. For example, if the tone of the poem has the wrong feel – “didn’t want magniloquence to take away attention from fundamental matters”. A text about changes, forever changing. The state of being unhewn gives potential and is, in itself, fascinating. Concept of a catchment area: A place where something collects as it lower than everywhere else, water flows here. Questions for Jonimatti: How did your residency period affect your writing? How do you perceive the relationship of the place and area with your writing? The relationship is direct and tangible. For example, in a noisy and social environment rather than a private study. It is great to be able to read to a receptive audience. For instance, the poem “Tutkassa näkymätön syke” (Radar has an invisible pulse) was read here last autumn. It was important to be able to test how the poem worked. Small audience and intimate setting. Reading is a good mirror for your writing. Reading aloud to an audience when the work is still unfinished but ready enough to be shared. Then it is still possible to change any parts that may be misunderstood. For example that poem: it starts with a depiction or state and someone experienced this very strongly, but in a different tone than I had intended. I was still able to make adjustments. At that time Joni had a workroom in the barn. Chalkboard walls. An unfinished novel was left open in the room and some people went into the room. Strange way to share it. Someone leafed through the book without understanding a word. On the island of Satava in Turku an adder was eating a slow-worm. A walker, the adder and slow-worm all end up in the same place. Place: Black office chair that started to wobble because I sat on it so much. If you go to another place does the text change straight away? Jonimatti: I was sitting on stones by the water in a nature conservation area, writing, I was disturbing the wildlife. But it didn’t matter, because I believe I belong among them. Watching the slow-worm and how he moves, a careful mover that relies on its sense of touch. He will also make his way into a fantasy novel, with worms, and other things. When working you find many different places, such as Kaarina, Satava in Turku, Vammala and all kinds of other places. Anna: Do all of your poems have a special place? Jonimatti: At the editing phase, at the latest, there is no place, the connection with a place disappears. Antti: Has read the piece in its various stages. There are certain themes or “topos” that have come close. The theme of an unhewn tree, for example, that is related to the Taoist concept of how the mind should be when it is good. It is interesting that they all have animal forms. I can’t come up with a final interpretation of this and this is a good thing. A classic in Christian mysticism (reads an excerpt of a poem, which I recognise). It is very difficult before you are ready for it – you can’t do it on behalf of someone else. Interpretation defines the way that you should read it. Idea for group work: Tuija points out that we do not have any fixed themes or goals for the discussion. Antti: Uniqueness is written into the piece – this means the story can no longer be told exactly as it happened. If there is some kind of relationship with the poem, a relevant relationship, a chaining of uniquenesses is formed, the certainties move in connection. When you read the piece again and enter it and the places described, their constellation changes and are not experienced in the same way again. The places are not necessarily tangible in all interpretations. When research is associated with repeated matters, then put very simply, artistic information and art are associated with uniqueness. The difference between research and artistic places does not mean that there is no way for them to meet. Tuija: don’t we all talk about the things that we are not supposed to. Antti: Some things are harder to talk about than others. Jonimatti: An area of unique experiences. The place for the event, where the adder eats the slowworm. I have a memory of what I saw and the experience and the moment, an idea of where I was coming from, but then this soon turned into imagination. How should this be put, so it conveys what I want it to? The uniqueness that has prompted me to write about it has led to many forays into documenting it somehow, into the form of the way that I may have experienced it. However, I have also forgotten what I experienced. And when I re-read it I get a kind of feeling of what I am trying to say. I can only hope that someone else gets something relevant from it. Antti: Your specificness and eachness are the things that speak to us, but as a writer and poet you take responsibility for that accuracy. Accuracy does not mean that you would experience it in the same way, but that it could multiply. Specificness or eachness – if they were alive then they could multiply. A singular expression is something that we are responsible for, that it is sufficiently accurate, specific, could be made into a sequence, multiply. Exact, accurate, pure. But I have a long history of discussion with Jonimatti. We have chewed over these words (same ones?) for possibly 15 years. I am confident that it will continue its life but multiplying in unexpected ways. Exchangeable? The state of being exchangeable exists, but the method, reason for this – different text and – if the place or state is strong or meaningful in an unsolvable way – can’t be mended or replaced. The pre-conceptual half – is something that is broken. In every place that is given a meaning something is always broken. The state of being broken can’t be changed. Juha: Helvi Hämäläinen’s texts are in my mind regarding this place where we are sitting. These trees. Hämäläinen writes the way she writes, like a tree creates its leaves. It happens. The leaves fall. When the work of art is ready, it is over, it cannot be read. What mark does this leave? Taoism. Association. Antti: Certain Taoist ideas are connected with Taoist ways of seeking or sensitivity. Stories of flow, deflection, transformation are at the core of many Taoist classics – what is strength, what is intensity? What is a simple text, what is a complex text? Transformations are an element of Taoism. Working with fragments. It’s not such a far-fetched idea that fragments and shards are connected. Grains of sand, says Jouni. The place is somehow a splinter of the world. In a few directions at least. Significance of nature, urban areas, the countryside? Jonimatti: I spend an annoyingly little amount of time in the forest, a surprising amount of time in urban areas, I occasionally go to the countryside. I have the ability to find wasteland areas. It’s not a clearly demarcated area. A short walk from where I am staying. Jonimatti: I am happy that the text is so open that there is room for readers’ experiences. The text has many roots in so many times, segments. Interpretations that enter intimate areas. Avoid doing. Because this narrows the ways in which readers can read the text. Do people’s experiences affect the way people read in some way? Jonimatti makes observations of people’s existence at the moment of reading. No knowledge of how this relates to the text or the tone. I return to my own texts in a certain way, even in a narcissistic way – “what had I done or who did I think I was?”. Open textual world. But on average: doesn’t have an impact. The confusion related to remembering and maintaining memories, what does this do to people? Tree roots. I remember that last week I remembered. Already changed into something else. You can write with the subconscious. The roots that I have not spoken about, but they are there, so maybe the roots speak to the reader from under the ground. I fantasise. Romantic idea of an artist as a channel for something else? It is a question of the manifestation of something else. Yourself as a sewer pipe. The places are non-human, in debt to someone else, should not approach places in a too anthropocentric way. A landing place for various animals and phenomena. The discussion was on sound artist Antye Greie’s piece Sound of Hailuoto. The piece is a free sounds app that can be downloaded onto a tablet or mobile phone. In the artist’s words, it is a “community matter”. The piece is a community and communicative project that talks to the world. It can bring the sound landscape of Hailuoto to the centre of New York, for instance. The piece and its preparation process are characterised by participation and an educational element. The themes related to listening and identity are integral. Sound of Hailuoto is based on the ideas of children. The nature of the piece is participatory, and it was produced in cooperation with 25 children. The fact that the piece describes the island of Hailuoto is based on their ideas. During the process, the children were told about the technology behind the development of the application, such as graphic design, game design and coding. For the final application, Greie drew the island and the children recorded sounds from their surrounding environment. In the app you first hear the school bell, the sea and birds. In the piece, art functions as a way of empowerment and is given educational significance. Sound of Hailuoto increased the children’s awareness of the place and taught them how to observe. The meanings created by the place and environment are fundamental in the piece: loving the place that you are from and building confidence in the place. Nature and technology combine in the piece. The connection with the environment is produced through technology. Educational significance is also emphasised through technology. Children use technology a lot, but they do not know what it is based on. Schools do not teach what is behind the internet. The process to create the application taught the children about technology and what is behind it. In the piece, the media is inside the media. The application conveys sounds while sounds convey images. Sounds create connections. Sound also weaves things together. Sound can continue forever and the matter functions as its intermediary. The visual side of the piece, the island, is also associated with the connections. The sea connects it with many places. The connections produced by the sounds are connected to experiences, for example people and places. The sounds produce images and associations for everyone, irrespective of place. They are global. In this way the piece is universal. However, the sounds also activate feelings and this makes experiencing these sounds extremely personal. The memories connected with the sounds are personal. Sounds have a huge significance for the subconscious. The application encourages children to focus on the environment in which they live; it also introduces new dimensions to their everyday environment. The piece’s preparation process lasted a long time for the children, which meant real experiences for the children and hard work over a long period. It takes time to create a bond with children, which also demands a lot from the artist. Sounds and the internet highlight global issues. Does the internet make it possible for people to get their hands on anything, no matter where they are. The internet creates connections and thus bestows channels and methods of interaction even to those who are otherwise isolated. However, the problem is that internet is not available everywhere or for everyone. The place or skills may limit its use. And how is the internet connected with local values? How does it affect the way in which children understand where they are? Does the internet create an understanding of a place, and what kind of a place? Is everything just one public place? At school children are hardly taught anything about technology or how to use the internet, but despite this they know how to use them better than adults. However we do need to find new ways and methods that will enable us to handle and understand the ever increasing amount of information. Otherwise reality will not be able to keep up with the digital world. For example, computer games can affect the way we understand reality so that we think life is a game. Software and computer games affect our behaviour, even though it also goes the other way from the real world to the digital world. What kinds of moral questions arise from the relationship between the digital world and the real world? We need to find a connection and balance between these two worlds. How can we change the world with documentaries?